L.A. Twister, one of the latest releases from indie distributor Indican Films, takes its two main characters and puts them in a story within a story as they create their own movie despite having no experience in the industry. Lenny and Ethan are our seemingly hapless heroes, and they work pretty well as sympathetic everymen. Lenny (Zack Ward, looking more than ever like a grown up Scott Farkus) is an aspiring actor who has abased himself in almost every possible way in order to get a job. When we meet him, he's sleeping with a most unpleasant casting agent who guarantees him the starring role in a brand new cop series for television. Needless to say, she's less than up front and honest. When Lenny shows up for his first day on the set, he's understandably dismayed to discover he's compromised himself for nothing more than a part as an extra. Maybe. If they need him. Meanwhile, Lenny's good buddy Ethan (Tony Daly) is going through the pain of a freshly ended marriage. Dumped by a cheating wife who seems like such a shrew it's hard to believe he's so distraught, Ethan heads to L.A. to hang with Lenny so that he might recover a little bit. He seems to have little trouble finding plumbing work at various homes of the wealthy folks who influence the city. Still, with Lenny frustrated over job opportunities and Ethan depressed over lost love, a friend suggests that they might write their own ticket out of their funks. He tells them that he'd heard about a couple of guys who'd made a film for just a couple hundred thousand dollars, but made millions (one can only presume he's talking about Daniel Myrick and Eduardo Sanchez). Maybe they could do the same! He even promises to front them the money. What follows is a film within a film as we watch the protagonists work to make their film - and the movie that they make is about the process. The film jumps back and forth in time and chronology and you're never quite certain whether what is happening is supposed to be real or if it's what is taking place in their production. As things progress, Lenny and Ethan experience various work-related hijinks as they both search for love, money and success. Though Ward (who I always remember most fondly as Almost Famous' Red Dog) is quite solid and amusing in the film, it's Tony Daly who is most appealing. Ward is impish and clever, while Daly is more reserved and inscrutable. 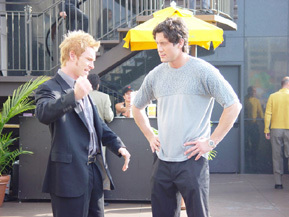 Both actors offset each other quite nicely, as their natural differences play well to the characters. Also playing a critical role is Jennifer Aspen as Mindy, Lenny's love interest. She's far from a typical leading lady, but she has a great sense of timing and humor. For purposes of the film, she's the seasoned professional and a trained Shakespearean actress. L.A. Twister's script, written by Jeffrey Saville-Read, is unafraid to go out on a limb and be unique. Director Sven Pape embraces the quirkiness with an unabashed glee - the film is consistently weird, talky and even occasionally abrasive. Sometimes events get pretty convoluted, which is to the movie's disadvantage, but the characters are always real. These two guys might be people who live next door. Or your best friends. Like an episode of Seinfeld, though, there's not really very much that "happens". The guys run around the city and meet chicks, play naked twister, get hit on by prospective money men, and even hit rock bottom. Even so, there's not much of a sense of conflict or urgency. Lenny and Ethan are just bopping along, making a movie, and you're along for their ride for better or for worse. The idea itself isn't necessarily original, either, but the leads are so human that they're intriguing to watch nonetheless. By no means is L.A. Twister a perfect film, and it might not even be a great one. Still, it's interesting to watch and I always applaud anyone who is willing to go out on a limb and create something that follows their own individual dreams. L.A. Twister feels like just such a film - deeply personal and yet still fun. And funny.